states of IOCL Pipelines Division. 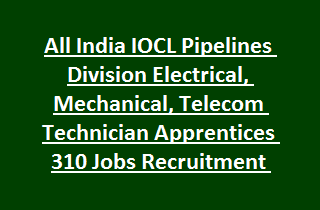 Total Technician Apprentices vacancies available in IOCL Pipelines Division Recruitment are 310. The period of training is one year from the date of engagement. Educational qualifications required is Full time diploma in Mechanical/ Electrical/ Electronics & Communication/ Electronics Engineering discipline from recognized Institute. Minimum age of the candidate is 18 years and maximum age limit is 24 years. Selection of candidate in respective trade is based on written test and personal Interview. Written test will be held for 85 marks and Interview will be conducted for 15 marks. Minimum qualifying marks is 40%. For SC/ ST candidates 50%. Interested candidates have to go through the IOCL website www.iocl.com and apply for Technician Apprentices Jobs from 16-10-2017 to 06-11-2017. For more details of age limits, pay scale, qualifications, selection process, Application procedure of Indian Oil corporation Limited IOCL Technician Apprentices Jobs recruitment are given below. Total no of vacancies available in Indian Oil Corporation Limited IOCL Recruitment are 310 posts. Post Name: Technician Apprentices: 310 posts. 1. Eastern Region: 69 posts. 2. Western Region: 94 posts. 3. Southern Region: 30 posts. 4. Northern Region: 75 posts. 5. South Eastern Region: 42 posts. State wise, Trade Wise and reservation wise vacancies are mentioned in the IOCL notification. Full time Diploma in Mechanical/ Electrical/ Electronics & Communication/ Electronics Engineering discipline from recognized Institute. Period of training is one year from the date of engagement. See the IOCL notification for more qualification details. Monthly stipend for Technician Apprentice Jobs is Rs. 7530/-. Minimum Age limit is 18 years and maximum age limit is 24 years as on 16-10-2017. Selection of candidates for IOCL Recruitment vacancies is based on their performance in written test and Interview. Written test will be conducted for 85 marks and consists of 85 objective type multiple choice questions. Out of 85 questions, 60 from Diploma level in concerned discipline and 25 questions from General Aptitude & reasoning, General Hindi/ English, General Knowledge and Numerical Aptitude. Final Merit List will be prepared based on marks in written test and Interview. Read the general instructions available at IOCL official website https://plis.indianoilpipelines.in. Application forms available at IOCL website from 16-10-2017. Last date for submission of applications is 06-11-2017 by 18.00 hrs.